The front room of The Bungalow offers a beautiful desk, comfortable couch, cozy fireplace and flat screen TV. Welcome to The Bungalow Pasadena. Make yourself at home in this comfortable, designated historic, 1922 bungalow. Enjoy the convenient location and all the amenities and charm The Bungalow has to offer, including a remodeled kitchen and bathroom; secluded, shaded private patio with sitting area, a striking colorful bougainvillea, washer and dryer, and gas grill; beautiful landscaping with several fruit trees and a herb and butterfly garden; a cozy fireplace, TV and high bandwidth connectivity. Queen bed, with ceiling fan, side shelves, closet and dresser. The bedroom offers a comfortable queen bed, closet and dresser space. 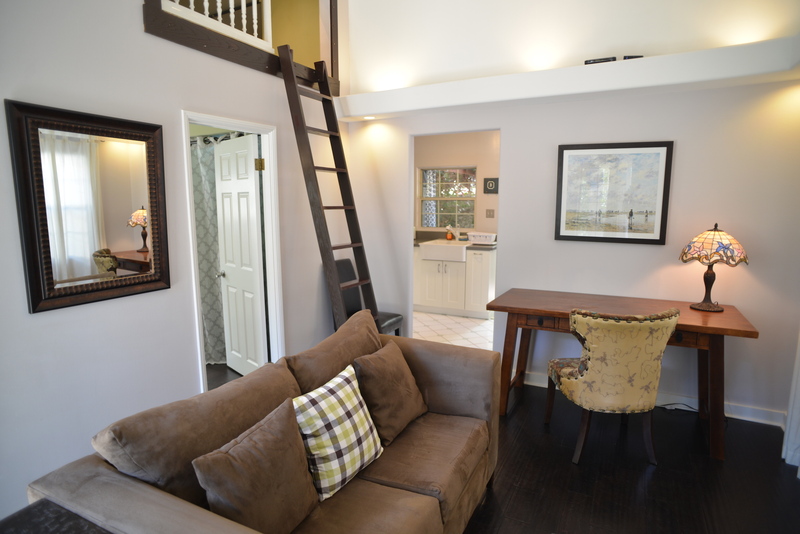 The sleeping loft is accessible via a ladder only, off the main living room, which has two comfortable twin beds. It’s like sleeping in a treehouse, and offers a bit of privacy. The bathroom has been remodeled and includes a stand up shower, vanity and plenty of shelf space. The Bungalow is within easy walking distance to Pasadena City College (PCC), Colorado Boulevard for the Rose Parade, shopping and restaurants, beautiful Green Street and the California Institute of Technology (Caltech) to name but a few. Several local eateries and coffee shops are only minutes away by foot. Within a mile or two are the many wonderful sights and attractions Pasadena’s unique districts offer, including: Old Town, South Lake, Paseo Colorado and the Playhouse District; the world famous Huntington Library and Gardens; the Gold Line metro which can take you to downtown Los Angeles and Union Station; and the world class Norton Simon Museum. Likewise, many restaurants, live entertainment venues, the Rose Bowl, and cultural attractions, are just minutes away by car, foot, or public transportation. It is freeway friendly, yet quiet and secluded. Parking is available on-street only and with an overnight permit. Please see my parking information sheet. Permit is included. The Bungalow Pasadena offers a wonderful, comfortable, charming and convenient place to stay in Pasadena. It’s likely you’ll not want to leave!